Servant Jacob, I, the Lord God, have distinctly different, but in My eyes, truly comely children living and dwelling upon this earth today. Many of these children are tender hearted, fragile, innocent, and gentle in their approach to the people who are all around them. They are also humble and kindhearted to the people they come in contact with and know. They would not think to steal, corrupt, damage, or hurt any of the people who are near them today. Though these beloved children I Am speaking about now are often locked up, put away, and shunned by others, they are already perfected and beloved in My eyes. For they are not sinful or deceitful in their ways. Though they have been locked up in many dismal places of wrath and destruction for their gentle and kind approach to life, they are still gracious and respectful to their detractors and their enemies. For I know many of them do not desire to steal anything or hurt anyone. I also know many of them cannot be seen or heard from in the locked up places they are surviving in today. However, I, the Lord God, have loved them, Jacob, with an everlasting and passionate heart. I have shown them things of an heavenly nature that the other people near them cannot begin to fathom or see. I have covered, enriched, and protected them from all of their enemies. I, the Lord God, have used these distinctly different and gentle children here as a buffer and as a controlling factor to stop the evil and darkness that exists everywhere upon this earth today. I have used some of the most fragile and gentle of them in their state of affliction and devastating diseases to drop many righteous seeds for Me and My Son, Jesus. Therefore, many of them are now testing and challenging many people�s hearts and minds for Me and My Son. These beloved but fragile children have helped me to see what many heathens as well as lost and dying people really believe in their hearts and minds. For through these gentle and fragile ones I Am able to see inside people�s secret hidden agendas, while I Am looking at their weaknesses and strengths. For I Am always looking to find clean hearted and clear minded virtuous children upon this earth today. When they want to be secure in My arms, and faithfully reverent to obey My orders to them, I often use them as servants and teachers of righteousness for Me and My Son, Jesus. I often find them through the eyes of My Son, for He is My fanning wind and My consuming fire upon this earth. I also enjoy being the Master potter over them. I look after them as My pliable but fragile clay. For I, the Lord God, enjoy washing many of My pots clean with a consuming flame and a fire upon them. My distinctively different approach to this world cannot be readily seen or understood by the people here who do not want to take the time to know Me or seek Me properly in My heavenly realm. For I, the Lord God, am of pure delight and holy beyond measure, servant Jacob. Therefore, a vast central veil exists here between Me and this world. This veil is so difficult to pass through that only My Son, Jesus, can move through it and remove it�s force in the noon day sun. For I, the Lord God, like to see My children when they are like delicate flowers opening in the morning light. If they are as passionate about Me, as I Am about them, then soon they will be receiving a portion of My eternal love, wealth, reward, and blessings. 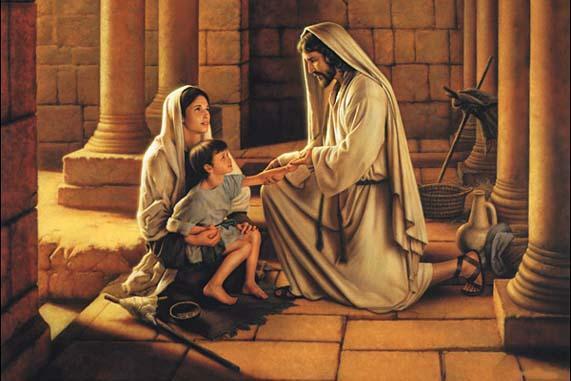 I love to see them when they are devoted to Me, My virtuous ways, and My Son, Jesus. Though many of these beloved children of Mine today may not be appreciated or spoken about by others as being desirous children to be loved and wanted, they are the apple of My eye. Though many of them have now been placed last upon this earth, they shall soon be first in line with Me when they are able to eat from My table in the heavens above. For I, the Lord God, am already using many of these distinctly different, fragile, and gentle children here as ministers, teachers, and testifiers of what I, the Lord God, desire My new twelve tribes of Israel to look like. I Am using them as examples of what I want My twelve tribes to achieve for Me and My Son. I Am using them as examples and pillars here of the meekness, purity, holiness, piety, patience, love, innocence, and beauty that I want the rest of My children to strive for and achieve today. For I, the Lord God, did not create this world called earth as just a refinement refuge for My strength and My virtue to be seen. I did not arrange it in a specific order, or put it all together, as just a depository for evil, confusion, sin, and disarray to exist. Instead, I spent many a day creating this world called earth so My name, My passion, and My creative abilities could be seen here. I made this world called earth as a place where My children could find refuge from the many storms that continually take place here. I also fashioned and created it so My future kingdom could be appreciated when it starts to unfold in My new day. I, the Lord God, made this world as a place where My throne could easily be seen by the wisdom seekers who now truly desire to carry My name into the utter most parts of this world called earth. For I know they truly desire to love Me dearly and tenderly in their own hearts and minds. I know these lively ones wish to bear My Son�s cross upon the seven seas, and upon their own shoulders. Therefore, this world called earth will soon be a peaceful place of refuge for My beloved ones to rest their feet upon when I decide to come here and dwell with them. In the meantime, servant Jacob, because of the fairness and justice that remains in My heart and mind today, My distinctly different and fragile children will soon have a harvest and feast of their own. In the coming seasons of time they will have their own special place of prominence and wealth with Me and My Son, Jesus. For in My coming new day they will have another opportunity to accept My Son, Jesus, when they are transfigured and restored to the perfection they truly deserve. Then they will be brought into My presence and into My courts to accept and revere both Me and My Son. Because I know many of them have served Me wisely but unknowingly upon this earth today, I, the Lord God, will make an exception for them to come to Me when they are fully functional and restored. For I will want them to acknowledge and recognize their place as the new pillars of My coming unified and glorified church. Therefore, in the next few seasons of time, these distinctly different children will be first in line to receive all of My love, favor, and attention. They will be first in line to receive My blessings, My bread of life, and My goodness, even though I know many of them today are shunned, ridiculed, and rejected by others as not being worthy. In the coming days they will learn to serve Me in many different ways when they are dwelling near Me in the mansions that I will make for them. For I, the Lord God, will soon restore them to the perfection of quality, beauty, and true consenting grace that they deserve, and I require. I will take away all of their infirmities, sad memories, diseases, and afflictions in the coming time of My new day and My new, eternal glory. Soon I will give these fragile children new strong hearts, minds, and bodies of true life, vigor, and eternal wealth. Then they will not have the frail and damaged hearts, minds, and bodies they now have today. Then they will be My first children of the power, light, and glory. Then I, the Lord God, will love and nourish them beyond measure. For when I take them up on the third day and restore them to perfection, servant Jacob, then they will be serving Me with rejoicing, singing, and true righteous virtue, forevermore.